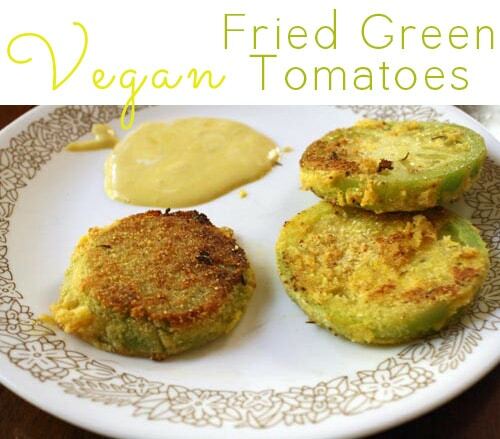 These vegan fried green tomatoes are just as crispy and decadent as their conventional counterparts. Our CSA basket on Wednesday included three beautiful green tomatoes. I don’t know about you guys, but I can’t look at a green tomato without imagining it dredged in cornmeal and fried until it’s crispy. It’s been super busy around here between some new freelance work I picked up and getting ready for the Indie Craft Experience this weekend, so I’ve been sticking to the quick and simple, like these delicious tomatoes. I served them along side some sauteed kale and tofu. It was just what I needed to power a Lunch Kit sewing session! Whisk the Vegenaise and mustard together in a shallow dish. Coat each slice of tomato in the mixture, then dredge it in the cornmeal. Be careful not to get cornmeal into the mustard mixture, because this is also your dipping sauce. Heat the oil in a skillet on medium heat, and place the tomato slices in the pan. Fry for a few minutes, until brown on one side, then flip and brown on the other side. Serve with the mustard sauce for dipping. 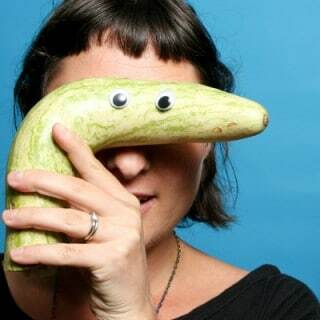 Woah, yum! I do have some left, and I think I’ll need to pick up ingredients to try this when I hit the store this week! I’m a sucker for a good fried green tomato! I’ve never had a green tomato – if I ever find any I’ll definitely be deep frying them. 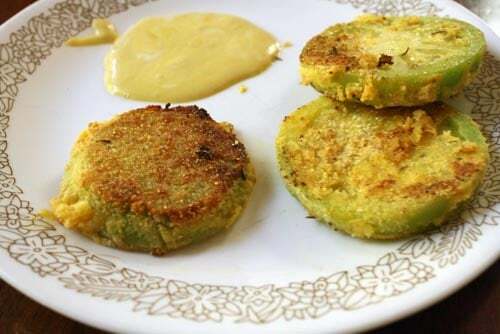 love fried green tomatoes… yours look perfect!